Nobody likes getting bombarded with spam in their inbox. Some people mark emails as spam and it gets reported to their ISP or email provider. 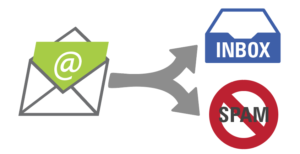 Alternately, some ISPs or email hosts generate their own rules (which can be adjusted somewhat by users) to automatically funnel certain emails to junk or spam boxes. Follow these simple steps to make sure you don’t end up in the same place as the emailed pharmaceutical ads. It’s never okay to use purchased lists, and reputable email clients (such as Mail on the Mark) won’t even let you use them. Purchased lists have unverified emails and may contain SPAM traps. If you send your email to a spam trap, you can end up on a spam list… ensuring your emails never end up in your subscriber’s inbox. One way to make sure your email list contains only people who want to be receiving emails from you is to have a two-step sign up so that subscribers have to opt-in via a confirmation email once they have subscribed. Read more about permission to send here. Having people add your “From” email to their address book is an easy way to make sure that it doesn’t end up marked as spam. You can add a note saying, “Don’t forget to add myemail@mydomain.com to your address book” right alongside your signup form. Speaking of your “from” address, make sure it’s obviously from you. People are less likely to recognize your mailing if it’s from some random email address they’ve never heard of. Avoid changing your “from” address from mailing to mailing to ensure people identify it, recognize it, and receive your newsletter. If someone is no longer interested in your mailings, give them a way to get fewer mailings or to unsubscribe altogether. This way people aren’t marking you as spam when all they want to do is hear from you less or have changed their interests. Unsubscribe links are included in all Mail on the Mark templates and anyone who chooses to unsubscribe is automatically and immediately removed from your lists. However, you may want to consider giving an alternative that is less final than completely unsubscribing; consider having an option to receive less frequent emails. If you don’t send an email for a long time, people may forget they subscribed in the first place. Your subscribers are signing up for your newsletters because they want to hear from you, don’t let them down. It’s most critical to send your first email quickly after someone subscribes to your list. It’s easy to automate this using auto-responders so you can capture their attention while they are most highly interested. Don’t forget to feature valuable content in the emails you do send out. People are overwhelmed with email and may not remember your business or organization when your email arrives in their inbox. But if they are able to quickly recognize your brand, they are more likely to remember who you are and how they got on your mailing list. Using consistent design elements not only enhances your brand image, it decreases your chances of accidentally being marked as spam.